Does Your Mailbox Need a Little TLC? As homeowners, the USPS charges us with the responsibility to maintain our mailboxes and posts in good working order. Also, as members of the Leacroft community, it is in our own best interest maintain the appearance and uniformity of our mailboxes in the neighborhood as a component that contributes to the overall appearance of our community. This has a direct impact to the market value of our properties. In the next few weeks, you may receive a letter from Holloway Management if your mailbox and/or post is in need of repair or does not conform to the HOA guidelines. All that may be necessary is a little sanding and repainting of the mailbox and post and maybe resetting the post. However, if you feel that replacement is required, for your convenience, we have contacted a company that sells replacement mailboxes and posts to match the ones we currently have and have been approved by the HOA. You may contact them directly to purchase your mailbox and post at retail or you can contact Pamela Wisniewski, you new HOA board Secretary, if you would like to work with your neighbors to get a group discount. 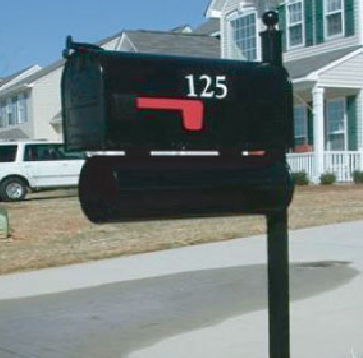 Carolina mailboxes can also replace the house numbers for your mailbox for $1/digit. They accept all major credit cards or checks by mail at the time of purchase. Contact and pricing information is below. Please specify your address and the bulk rate you would like. Orders will be held until we have enough orders from the neighborhood to purchase at that bulk rate. * Current Mailbox at Villages of Leacroft called the Eastfield with the T1 mailbox. The entire unit consists of the mailbox, poll, and newspaper tube.